Family of 4 Garden Harvest – Summer is Here! I think a lot of gardeners gauge that summer arrives when you harvest your first tomatoes. Well, we did just that today in the Family of 4 Garden. 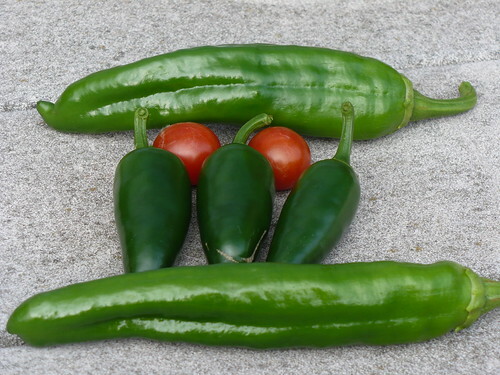 We harvested 2 cherry tomatoes, a few jalapenos, a couple chile peppers, and a couple marconi peppers. They don’t add up to much when you start weighing and counting pennies (this picture isn’t all the peppers), but it came to $2.13, which brings us to exactly $90 for the year so far! Posted on June 15, 2010, in Family of 4 Garden and tagged harvest, peppers, Tomatoes. Bookmark the permalink. Leave a comment.